The prefect explanation of book reading and reviewing – I think I paint my reviews with my own delight or lack of. How do you read/review your reads? This entry was posted in Post Script: Book Reviews and tagged book reviewing, John Steinbeck, reading. Bookmark the permalink. A great way to look at reviews. Like you I generally paint mine with delight. Those in not delighted in I hide away and make little to no comment on but it’s right that each readers makes their own perception of the book and that’s not necessarily what the author even wanted it to mean. Hit the nail on the head! Great quote! It’ fits my style of reviewing so perfectly – I don’t do academic analysis of my reads – had enough of that at uni -it takes the reading for enjoyment away from the process. Oh, I love this! And how true, too. We really do take what we want from stories, don’t we? Reblogged this on The Darkness in the Light. A perfect quote! It always feels to me, as a compulsive reader, that book and reader (so i suppose, book and author) enter into a relationship, and we will all form our own relationships with what we read. 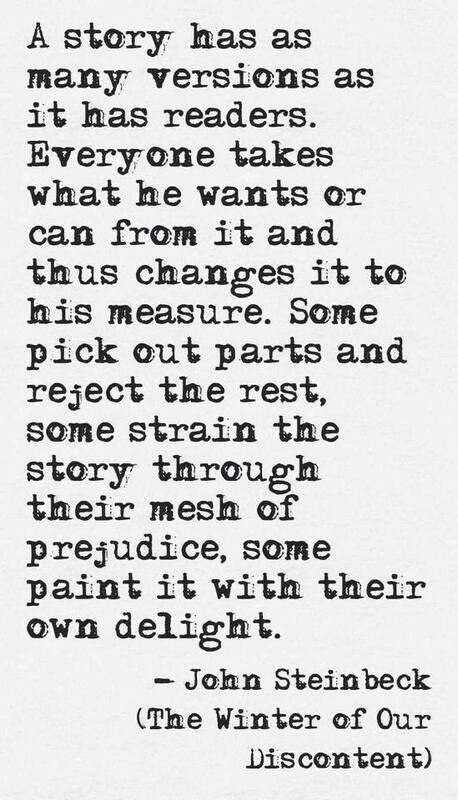 I would say we always filter through our own ‘prejudice’ – sometimes that ‘prejudice’ mesh filter is the paint of delight!. We have partisan responses, always. And that is fine. I find myself increasingly interested in knowing the personal response of a reader (and why) as it gives me much more insight into whether I’ll want to try my own journey with the book – and if I have already made that journey, the other reader will almost invariably add to what my relationship was, with that book. Thank you Janine I true and let the reader decide if it is for them but when something is amazing I cant help but share response. Carol, I have two or three impressions from each book I recommend. They have moved me, challenged me, delighted me and I try to get that across to my readers. Personal impressions/recommendations are the best.